Many people are familiar with the Lord Mayor's Show, which forms the central part of a day of celebrations to mark the start of the new Lord Mayor of London's term of office. Many people do not know that the Lord Mayor's Show began in 1453 as a River Pageant on the Thames - hence the term "floats" used to this day to describe the colourful Procession. The Show continued on the River for 400 years until the Corporation of London handed over responsibility for the tidal Thames to the Thames Conservancy, predecessor of the Port of London Authority, in 1857. The Show then switched to dry land and continued thereafter as a procession of "floats" through the streets of the City of London. The River Pageant was brought back for one year in 1953, to mark the 500th anniversary of the first event, when a procession of 150 craft travelled from Greenwich to Westminster. 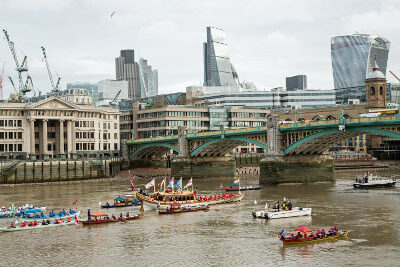 2011 saw the return of a River-based event as a pageant of approximately 22 traditional Thames Waterman's Cutters escorted the new Lord Mayor, aboard the shallop "Jubilant", from Westminster Boating Base downriver through Tower Bridge to HMS President. It has now become an annual event and will take place this year on Saturday 9th November 2013, when a pageant of upwards of 20 traditional Thames Waterman's Cutters will set off from Westminster Boating Base at 8.35 am and proceed downriver to arrive at HMS President at 9.30 am, where the Lord Mayor will disembark to continue his journey to the Mansion House by coach. At 5.00 pm, a firework display will take place from a barge held mid-river off HQS Wellington. The display will last approximately 10 minutes. For more information about the Lord Mayor's Show, please see the website (opens in a new window).